High-performance construction at home in urban neighbourhoods. This warm winter jacket is equipped with 2-layer H2No® Performance Standard waterproof-breathable polyester that holds up to your longest adventures – in driving rain or blowing snow. 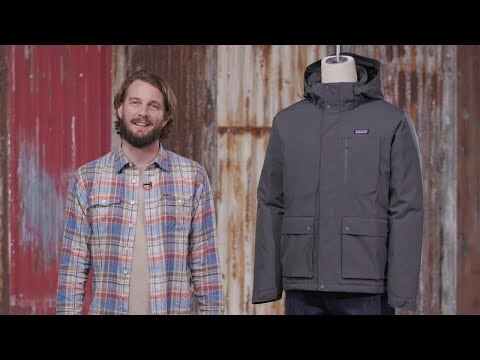 The 700-fill-power down (reclaimed from duck and goose down products) keeps you warm for a comfortable trip to the train or a cross-town trek for tacos. Made of 2-layer H2No® Performance Standard waterproof-breathable recycled polyester with a DWR finish. Fully seam-taped for total waterproofing. Insulated with warm, compressible 700-fill-power recycled down. 2-way front zipper has internal and external storm flaps to seal out wind-driven rain. Brushed microfleece-lined collar keeps you cozy. Insulated, 2-way-adjustable hood with visor can be removed when you don't need it. 2 side-entry hand pockets with brushed lining warm your chilly fingers. 2 front cargo pockets hold essentials. Left external chest pocket has a waterproof zipper and right internal pocket has a cord port for your headphones. Dual-adjust drawcord at hem seals in heat. Drop-tail hem provides rear coverage.